On Christmas morning, Elliott — who is now 5 and deep in the throes of Santa believing — dispensed presents from each of the stockings to the rest of us. He staved off his protests about having to see our gifts when he really just wanted his own. (He's a polite little boy.) Since everyone insisted that he go in round-robin fashion, and wait before all the wrappings were removed before moving to the next person, he had to be especially patient. As we reached the last of the stocking presents — which meant moving to the living room to deal with Santa's sack — he reached into the toe of the stocking. "How weird!" he nearly shouted. "There are pomegranates at the bottom of these stockings!" We all smiled at his confusion. But I was thrilled. Just a few days before, I had been thinking, "Oh man, I haven't bought a pomegranate this year. I'm going to miss this season." It's fitting that pomegranates were Christmas gifts. They're such decadent fruits, ruby-red and jeweled. That smooth skin is the color of lights on the tree, equally gleaming. And inside, little puckered seeds, poised to burst open with juice. Pomegranates seem impenetrable, the white pith between the seeds protecting them from being plucked. But if you cut them open, score the pith, and wack the back with a wooden spoon, all the seeds will release themselves, happy to be free from the imprisonment. Pomegranates are wonderful, wide open and juicy, ready for eating, if you dare. I've written about them before, with a recipe for chicken thighs in pomegranate molasses. But there are other ways to eat pomegranates, savoring, than raw and in molasses form. What are your favorite ways to enjoy this fruit? I have to say that i have been craving a pomegranate for weeks now - they simply aren't in season here in Australia right now and i refuse to purchase an imported fruit at $3.50 each. My favourite way of eating them is loosely following a recipe i got from Nigella Lawson, it's a pomegranate version of the dessert "Eton Mess". over a bowl of gf cereal! I love the texture contrast when the cereal gets a little soggy. So far, mainly as juice... Best with soda water and some shredded mint.I've also added a dash to stir-fries , here and there for added moisure and deliciousness.To date I've been unmotivated to invest so much money on an unknown quantity , although their rich myhtology makes them particulary appealing ( to me , at least ) . put it on a creamy vanilla mousse and it looks like pink kisses on snow :). I haven't tried this, but a friend of mine recently said that fresh guacamole with pomegranate seeds was fantastic. I am absolutely planning to do this the next time I get avocadoes! I really like to just eat them plain, though--they are so crunchy & juicy at the same time. It's like eating little tasty contradictions. I eat one a day in a salad with avocados, parsley and romaine lettuce with apple cider vinegar, olive oil, sea salt and fresh cracked black pepper...YUM! Oh, what a nice Christmas gift! Jealous over here, Shauna. I enjoy them with a sugar-free creme anglaise sauce, or sprinkled into my ricotta cheese for breakfast. Do you have a recipe for incorporating them into baked goods? We had a pomegranate tree when I was younger. I remember sitting under that tree and just eating and eating them. We would get covered in juice, but boy were the ever good. I look forward to eating them plain or on slightly warmed vanilla ice-cream every year. I usually open them up in a bowl of water - less mess that way, the pith floats and the seeds drop! I eat them out of hand or sometimes in a pomegranate cocktail - citrus vodka, pom juice, pom seeds and a little seltzer if you want fizzy. Yum! our favorite way of eating poms is to shake all the seeds into a bowl and eat like popcorn, 1 seed at a time or a handful, if you please. Grew up with a pom tree in CA. can't do without them. A guy in the Trader Joe's wine section suggested soaking pomegranate seeds in brandy (just to cover, refrigerated overnight) and dropping them in sparkling wine. It seems like a very festive way to bring in the New Year (drinking to good health with all those antioxidants), and I think they'll look gorgeous in a flute of bubbly. I love them fresh and jewel like uncooked and unadorned! How do you ensure that the pom/molasses are made without gluten. My gf husband is very wary to try bottled things from ethnic stores for fear of the processing methods. Do you have a brand you can recommend? I LOVE pomegranates! I have wonderful memories of eating them as a kid off the neighbor's tree in SoCal. But until we moved to Az, as an adult I hadn't gotten to enjoy them. I love them in lettuce salads with goat cheese and a simple balsamic dressing. I also love them in plain yogurt with a bit of drizzled honey and some walnuts. We planted a tree last year.......I can't wait! So odd that this was your post today as last evening my eyes locked on my unused bottle of PomMol and I thought "I gotta find Shauna's recipe for those chicken thighs." Many thanks for reading my mind. Happy, happy New Year to you, your family and all your readers. We love pomegranates... Last year they went into the cranberry sauce at Thanksgiving. But the usual way we eat those little jewels is in pancake batter- just toss a cupful into the Pamela's GF mix. Pomegranate Pancakes with maple syrup. Do you have any sources for pomegranate molasses? I really wanted to make that recipe and searched in vain locally for that one key ingredient. I love to add pomegranates to pork tenderloin as a nice contrast to the texture of the meat. I marinade the pork in tamari, basalmic, ginger, salt and pepper, and add the pomegranate in the final moments of cooking. The seeds add such a fun color! Some of our good friends in L.A. with a pomegranate tree in their yard make a delicious pomegranate meade every year and share it with us. I'm going to miss that meade now that I'm living across the country! i sprinkle a handful of pomegranate seeds over my plate of salad! for example: mesclun greens, shredded carrot, apple chunks, bits of brie, dijon mustard dressing. pomegranate seeds! I LOVE pomegranates!!!! I'll eat them any way I can. In a syrup over GF pancakes, in a fresh salad, or just plain where I just let the juice accost my taste buds. The fruit is simply yummy any way you choose. Recently I added them atop my Plum Chicken recipe, which added a whole new texture and burst of flavor to this already great dish. I love pomegranates to the point where I look forward to the season all year, and did a little dance of joy when my mother's pomegranate tree produced fruit for the first time this year. I feel so lucky, since I get most of them! I use the seeds in everything -- tossed in salads with vinegarettes, sprinkled on frosting of cakes, but my personal favorite is for Thanksgiving, when I crush the seeds down into a cup, cup and a half of juice, mix it with a full ten ounce jar of plum jam and a few tablespoons of soy sauce, and then use it to glaze the bird in the last thirty to forty minutes of cooking: This year, I couldn't find my usual golden plum jam and ended up using an apricot All-Fruit knock-off, and it was still fabulous. Ah, pomegranate. I haven't had that in ages. The first time I visited Saudi Arabia on a business trip many years ago, I loved the pomegranate juice they served! I had never seen it here at that time. Funny, I just bought one today. My little bird has cancer and I thought it would be a healthy food to give her..she loved them. And I juice every morning so I threw a handful of them in with the carrots and parsley etc. I bought them already plucked so I have a whole tub of them. The chicken recipe sounds delicious. I think I will try that. Just wish they weren't so pricey as I could eat/juice them every day. Pomegranates have been our tradition now for three years of holidays. We picked up three for our dining table decoration three years ago, ate them Christmas day, fell in love, and look forward to the tangy, crunchy, juicy yumminess every Christmas. We eat them plain, but I have always wanted to try sprinkling them on homemade ice cream. Vanilla ice cream. Just sounds like it could work. They are great in Khoshaf - a middle eastern dried fruit salad with rosewater, orange blossom water and pistachios. Claudia Roden has a great recipe for it. last year i made a champagne drink with POM juice and pomegranate seeds! heavenly! my roommate and I love to just open it and pour the seeds in a bowl and watch cheesy TV and eat them the old fashioned way. they are so delicious we'll eat all of them in one go. Broder's Pasta Bar in Minneapolis makes a pomegranate, chicken, & dried cherries pasta dish that is soooo good! I long for it EVERY year and then try to go and have it at least a few times before the pomegranates are out of season again. Thanks for a great blog! A few seconds before the new year arrives, the man of the family gets out of the house, with a small basket containing the following: a small pot with sugar, some bread, a few coins, and a pomegranate. When the new year is here, he knocks on the door, and before entering the house, he throws a bit of sugar - for a sweet year - a few coins - for a wealthy year and for the residents to be strong like metal - a bit of bread - so there will be food on the table all year around - and then, he fiercely throws the pomegranate on the floor, so it breaks and the seeds spill. Its red colour is for love and life, and its many many seeds are for abundance. This is what happens in Greece around 12:01 in a new year! Have a happy new year Shauna and Chef and wonderful baby girl. A better year than this one for you and the world. May your days be filled with health and smiles, as vibrand and as many, as the sweet pomegranade seeds. I'm back to talk about the pomegranate chicken ... I was reveiwing the recipe and my current issue of Cook's Illustrated (the stove top roast chicken) and wondered if the chicken thighs for this recipe should be skinless or not. Can anyone advise? Shauna? Wow, there are some awesome ideas here! So far, I've been pretty boring and only had its juice. It's a key ingredient in a recipe for "super" juice (a recipe high in antioxidants, which also included green tea, ginger, and cinnamon) that Dr. Christine Doherty shared at the GIG conference a few years ago. Loved this post about Poms ... something I enjoyed every winter when living in California. Now, in Indiana, they are few and hard to come by. But when I get 'em, I drop a few seeds in just about everything! Even mashed potatoes ... and they are like jewels in sweet potatoes. As I start the New Year, I would like to say that YOU, dear one, have been such an inspiration to me to learn to have some joy over living a GF life. And, in fact, I have (after a couple of aborted attempts) started my own blog! Not strictly ABOUT GF, tho -- a bit broader than that. But because I'm GF ergo the blog is also. So, young lady, you take care -- of yourself, your Chef and your flourishing Bean. A most Happy New Year to all of you -- and deeply felt thanks for spreading the joy that you do. My new favorite is pomegranate ice cream. It's amazing and you don't even need an ice cream maker to make it. The recipe is on my blog and in Nigella's Express). People think I'm crazy. 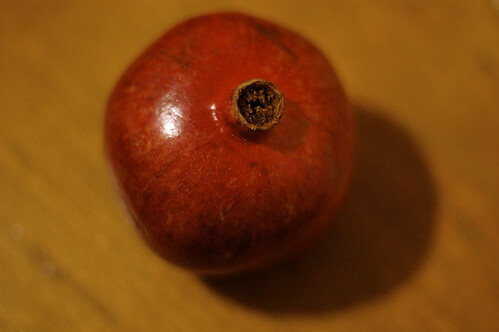 From October through late December, I eat a Pomegranate nearly every day-sometimes two a day. I LOVE this fruit. I spend a fortune on them and actually budget to afford them. The prices this year averaged about $2.50/each. Right now I'm very disappointed because I won't be able to get anymore here in New England until next year. I wish I could buy them from California and have them shipped year round. POM is the best brand. Always fresh and delicious. Muhammara - a middle Eastern dip made with roasted red peppers, toasted walnuts, garlic and pomegranate molasses. YUM. mmm... I love pomegranate! We had some over Christmas, too. We're traditional over at my house, just right out of the fruit, or sprinkled overtop of a gf waffle. They just look like such a Christmasy fruit with the gorgeous red colour. They are also really delicious in salads. I haven't had one yet this year. But each year when I get one I have to be careful so as not to get all of that juice on my clothes. I usually have to set aside one of my shirts that I wear when I am doing heavy duty cleaning. That way I don't ruin one of my nice shirts with the seeping beauty of the pink juice that seems to just spray everywhere. Pomegranate jelly! Best jelly in the ENTIRE world. My mother's friend had a tree when we were growing up, every year we got a jar of jelly for christmas, best present ever! I just made a pomegranate gluten-free cheesecake, inspired by your post. Thanks for reminding me of this delicious fruit! I love pomegranate. I lived in a city called Pomegranate. No kidding. Pomegranate in Spanish is Granada. Yes, Granada, Spain. One of my favorite recipes that I learned while living in Granada was pomegranate with Jerez sherry poured over it. We would break up the fruit and pour a little sherry over it and then eat it with a spoon. Over my pomegranate semifreddo! Funny but Santa always leaves us an orange in our stockings. Huh! I used the seeds to decorate some iced cupcakes recently - it looked so pretty! Just came back from a Mexican vacation, where I tried pomegranate-infused tequilla - also very fine! I also make pomegranate spinach salad for the holidays. Mine is dressed with homemade balsamic vinaigrette. The salad has gorgonzola crumbles, thin shaved shallot or red onion, toasted walnuts, and baby spinach, in addtion to the pomegranate seeds. Hi Shauna, that's such a cute post…pomegranate as a Christmas surprise…wow and cheers! is this your first gluten-free Thanksgiving?